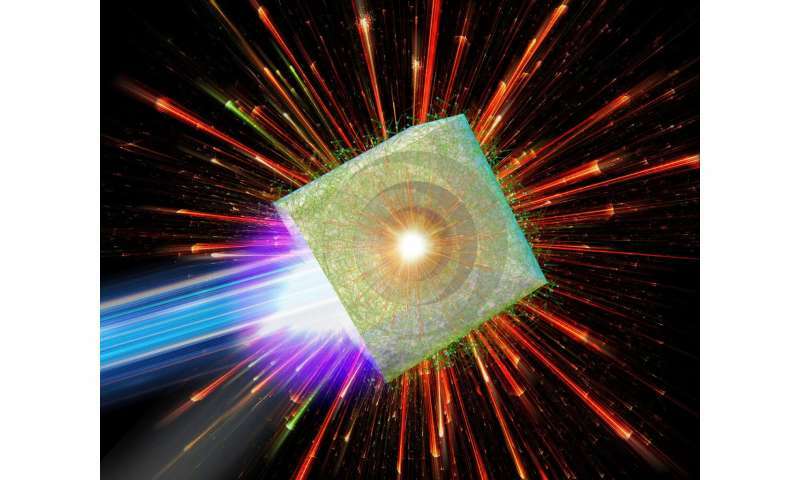 Could a particle accelerator using laser-driven implosion become a reality? Laser pulse compression technology invented in the late 1980s resulted in high-power, short-pulse laser techniques, enhancing laser intensity 10 million-fold in a quarter of a century. Scientists at Osaka University discovered a novel particle acceleration mechanism they describe as a micro-bubble implosion, in which super-high energy hydrogen ions (relativistic protons) are emitted at the moment when bubbles shrink to atomic size through the irradiation of hydrides with micron-sized spherical bubbles by ultraintense laser pulses. Their research results were published in Scientific Reports. The group led by Masakatsu Murakami has reported an astonishing physical phenomenon: When shrinking matter to unprecedented density, comparable to a mass the size of a sugar cube weighing more than 100 kilograms, high-energy protons are emitted from the positively-charged nanoscale clusters, a world first. Usually, an acceleration distance of several tens to hundreds of meters is necessary for conventional accelerators to generate such huge energy. In a micro-bubble implosion, a unique phenomenon occurs in which ions (charged particles) converge to a single point in space at half the speed of light. This phenomenon, which looks like the opposite of the Big Bang, is essentially different from any previously discovered or proposed acceleration principles. This new concept will clarify unknown space physics of grand scales of time and space, such as the origins of high-energy protons in stars and distributed in space. In addition, as a compact source of neutron radiation through nuclear fusion, this concept will be used in a variety of applications in medical treatment and industry in the future, such as proton radiotherapy to treat cancer, the development of new energy with laser nuclear fusion, cross-sectional photos for developing fuel cells, and development of new substances. I suspect the power density would be so low that even if the thing accelerated the electrons to the same energy as the LHC :) (snarking a tad here) the number of particles wouldn't be sufficient for meaningful experiments. I suppose I could be wrong, scientists always find the most amazing uses from discoveries like this that I am constantly having to update myself. Ya know, while I find this sort of thing infinitely fascinating I can find absolutely nothing about this that is 'opposite to the Big Bang'. I think what they are referring to is that the look of the mass collapsing to the comparable "sugar cube weighing 100 Kilogram" it looks like an implosion of the mass and energy coming together as if a singularity was forming. The Big Bang wasn't an explosion but an inflation and it didn't contain a dense mass....so where exactly is the similarity, here? I think they got the big bang backwards. It wasn't inflation, but rather a bubble popping. The inflation period was not the addition of energy, but the release of potential energy as something like "surface tension" took over. Expansion is not everything flying away from everything else, but all parts of the original "sphere" (or whatever you'd call the bubble-like object in multi-dimensional terms) collapsing in on themselves under the influence of gravity. We are not moving farther away, we are all just getting smaller, and the energy it would take to reconnect is greater all the time. So this would be the same as the big bang, not the opposite. Yes, I know the theory says 75% dark energy and 20% dark matter. Things you can't find and that would seem to violate conservation of energy and matter. But you need them for the theory, so they exist, and why won't everyone just stop questioning that? Yes, and if I remember correctly, wasn't there some other article on Pysorg a while back that saw so called 'bench top' (or some term similar) lasers as possible future accelerators? I must admit that I need to do a lot of reading about modern Lasers if I am to really appreciate the science involved. Again yes, I understand that F. Hoyle coined the phrase BB on radio because he hadn't got the time or couldn't think of another description that would fit. But an 'explosion' was not what he intended. Ha, rather ironic eh? And Rusi Talyarkin is vindicated........finally! Really? I thought that was done (at least partially) in 2012, Markus Stokmaier, and later with First light fusion (though this is nothing like a bench model) and don't forget sono-luminescence found much earlier last century. But of course, there is always a chance there was more to the case of Rusi Talyarkin being that Naval Research was involved, that is, it might be classified. I haven't heard of any new articles that suggest his 'bubble' research is being reinstated. Anyway, the present article is about Lasers and the quantum realm...analogous may be, but not the same, I think!